Editor’s Note: Since I had read much about her life before meeting her, I knew Maria has held responsible post-war government positions, including vice minister and a term in the legislative assembly where she continues to represent under-served groups such as women and children. I was pleasantly surprised to meet this down-to-earth, humble woman who talks with and feeds the chicks in her backyard before we sit down for the interview. She truly has her priorities straight. She chooses to live in this very same house she has lived in since she married at age 16. Maria is unencumbered by material things she has no need for in her life here in a small village in northern Chalatenango. The delightful twinkle in her eye and hand on my knee to draw me into main points bespeak her engaging personality. She clearly treasures the young man who drove us here and acts as our translator today. He is the son of her friend who worked together with her in organizing the poor rural folks to speak up for their rights. 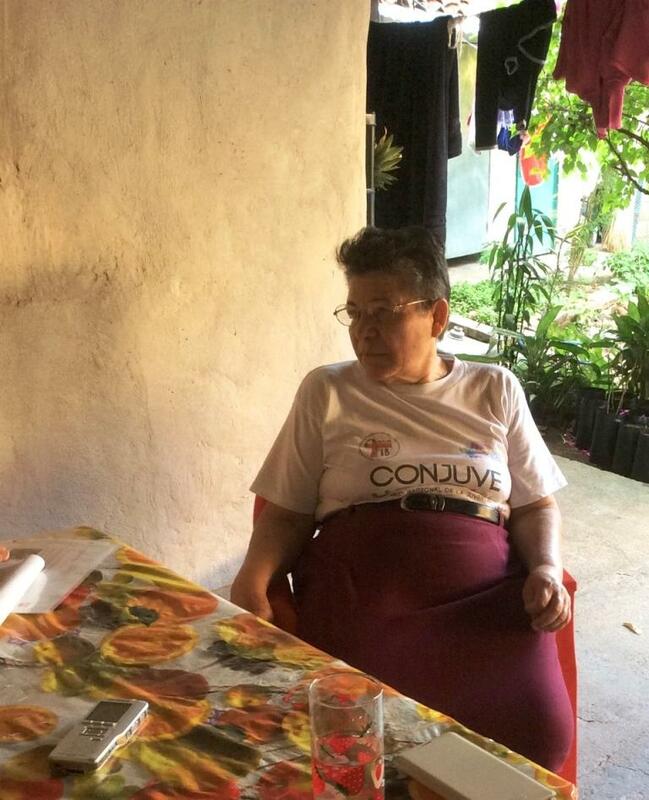 Anyone familiar with Salvadoran history of the past 25 years knows her name. Two American producers made a full-length PBS documentary on her role with the FMLN in the civil war called “Maria’s Story.” She didn’t like being singled out in this film. She doesn’t strike me as being one to enjoy being in the limelight at all. However, the film served a larger purpose, and she succumbed to being a part of it. It is a blessing to interview Maria; countless others have. Today, January 16, is the anniversary of the signing of the Peace Accords in 1992, and we await Maria’s arrival from a radio interview commemorating that occasion. We have no desire to duplicate the volumes of material already written about her life. 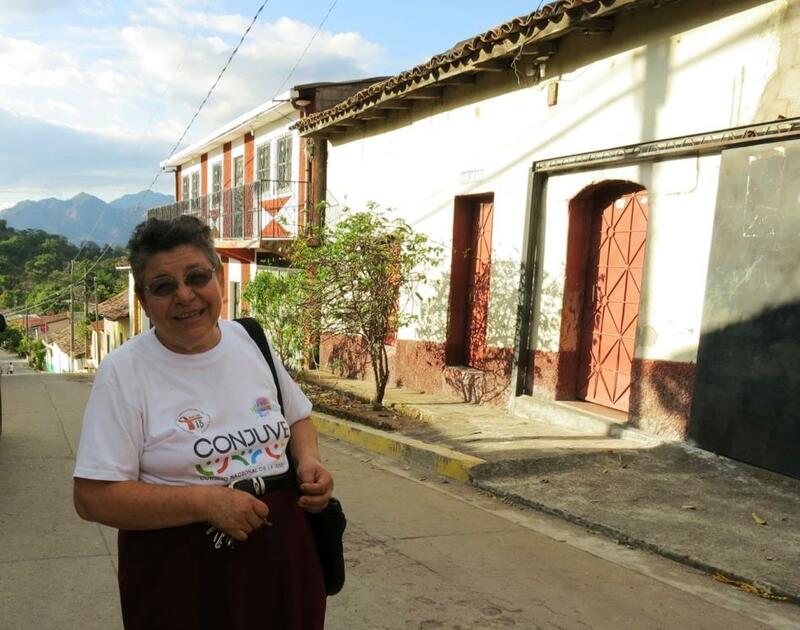 Instead, we build our story around who and what motivated Maria to act on the injustices she witnessed early in her life and continues to motivate her today at age 65. Meet Maria whom we find to be warm, genuine, articulate, and focused. 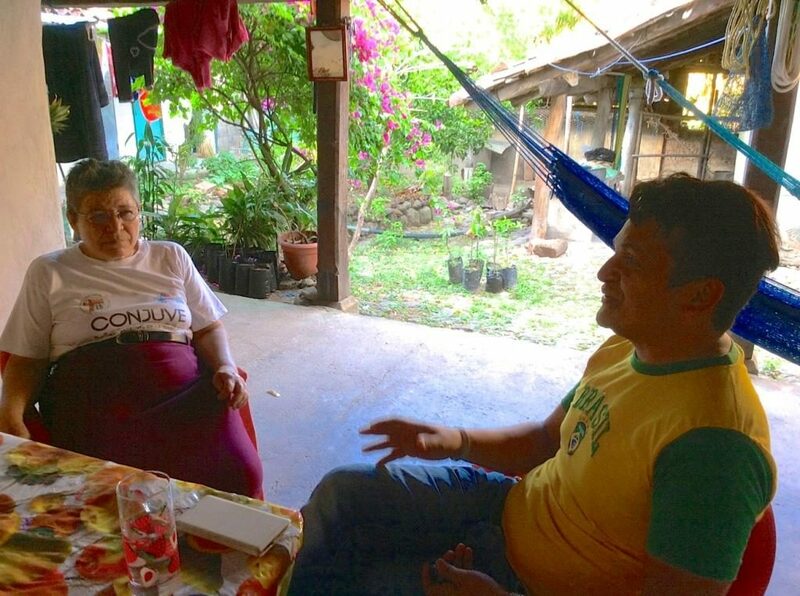 Maria shares her story on her back porch after just doing a radio interview to celebrate the day of the Peace Accords. This house is one block from where I grew up as a child along with my widowed mother and siblings. (I was number nine followed by two others.) Growing corn in the hills was our mother’s primary means of supporting our family, but she also took in ironing for other families in the community. At age nine I helped clean houses for people who would pay me by the chore. My mother was a hard worker and certainly a positive role model in my life. From the time I was a child, she also taught me that when I left home, I would have to fight for the rights of others. Even though we were poor, childhood was carefree and happy and dust, grass, and stones all became our toys. We didn’t recognize poverty as a problem. For example, none of us had shoes, but we didn’t know it was a problem; that’s just how we lived. Our mother insisted we all attend school, which at that time went through only grade six. There were no chairs; we sat on concrete blocks. There were no desks; benches served as desks. I began school when I was seven and completed sixth grade when I was twelve. There was a much larger blessing to this job than the wages. It was interacting with my employer’s oldest son, who was seven years older than I was and studying at a university in San Salvador. He was a leader for the opposition, a group called the Christian Democracy. (This is NOT to be confused with a group by the same name today.) He inspired me. He stood up for the poor people. Although he was from a wealthy family, he recognized the repressive group of military and would approach them to their faces challenging them. I felt he was very brave and courageous. He organized the youth in the community to spread propaganda. I was only 13 or 14, but he and I talked about the injustices, and his feelings represented my feelings. He enlightened me in thinking that by organizing we can make a difference. I lived injustices every day, but seeing it through his eyes made the situation become more a general social consciousness feeling about the whole community more than about my own personal situation. I saw my rights in the rights of others. 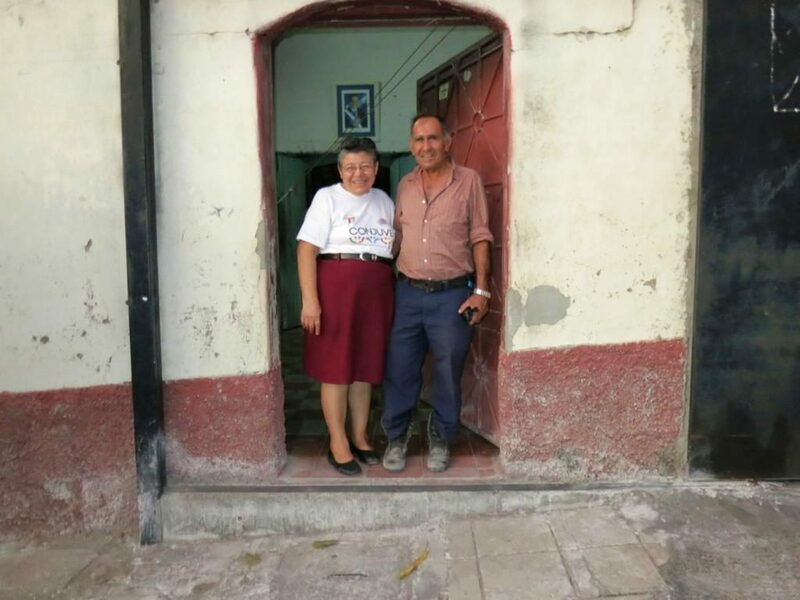 Maria and her husband whose marriage has survived so much adversity. After the 1972 presidential election fraud (ballot box stuffing resulted in victory for Molina rather than Duarte), I became disillusioned with elections and stopped voting. It became clear that in elections we could NOT make change. In 1974 when I was 24 after completing grades 7,8, and 9 of my education I helped organize the UTC (Unidad Trabajades Campo), a union of field workers. The goal of the UTC was to support one another in solidarity and organize to make changes. We wanted solidarity of the poor and social changes. It’s not that we wanted to change an entire system, but rather to see that the rich would treat their workers better. In my individual case my step-father owned land to work. However, most people had nothing. It was our hope that others would be able to rent land to be able to feed their families. Other groups across the country including professors, teachers, and students began to organize also. The more organized we became, the more repressions the military took against these groups. Disappearances began to occur. In 1979 many of us had to leave our homes here or risk being killed if we stayed behind. Our whole family including our four-year-old daughter left for the local mountains. We stayed there for the entire 12-year duration of the war. Both my husband and I fought with the FMLN. You had to simply to protect yourselves. But it was more than self-protection; it was for a just cause for all. Of course, there are many painful memories from the war. (We knew she lost a daughter in the war and did not mention it but her photo hangs directly above the table where we are seated.) There are also some beautiful ones. (We look surprised and asked her to share a beautiful war memory.) We always shared what we had with one another. There was a place called Hidden Water (this sounds like a hot springs), and I had three or four bouillon cubes and used the water to make a soup to share with everyone. Everyone was so impressed and wondered where I got it. They couldn’t believe I made it. This tasted particularly good when everyone was so fatigued from long days of fighting. 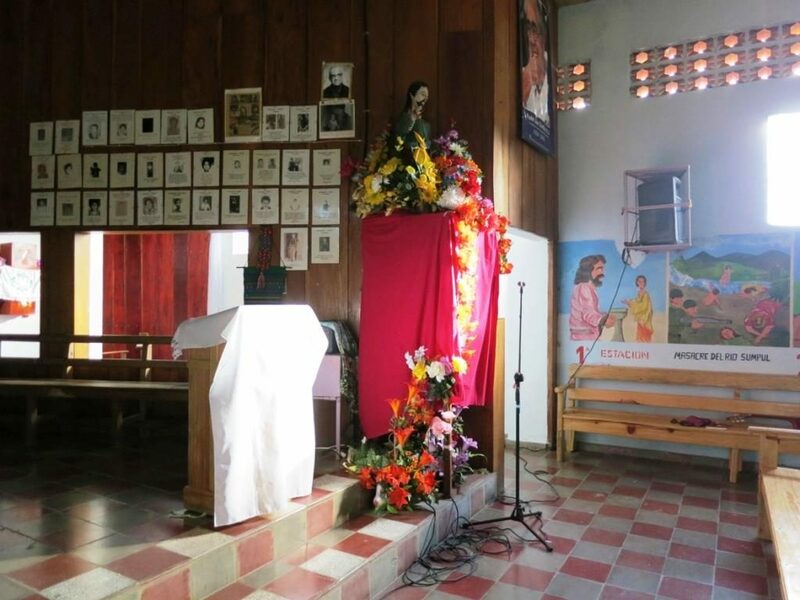 Arcatao’s citizens lost during civil war remembered inside its church. (Again not wanting to repeat the details from the documentary, “Maria’s Story,” we asked about its production and impact on her.) Pamela Cohen was a girl from the U.S. with a solidarity group and spoke Spanish fluently. (Catherine M. Ryan co-produced this film.) She and other journalists wanted to do this project. I didn’t want the focus to be on me because there were MANY people just like me involved in fighting for injustices. She convinced me that American society needed a specific concrete example to illustrate how their taxes were used for military bombs to kill innocent lives in our country. Reading is something I enjoy in my moments of quiet, and I choose books of all kinds to read. I just finished reading a scientific book dealing with how the code of your immune system can cure every illness. (She rummages on her table enthusiastically to locate it and then shares it with our friend to read). The pride Maria has in Christian exudes from her. If there is something to learn from living through war, it is to appreciate everything. I give everything a value. Even though I am old now, I realize that this is still a very young country. We have to accept the good and bad together. I believe there must be a reason for what happens. For instance, what if my mother had not encouraged me to fight for the rights of others? What if I had never met my employer’s son whose progressive ideas matched my own thinking and gave me encouragement and voice to act on my feelings? At the time we were in conversation when I was 13, I didn’t realize how influential he would become in my life. Two words I use to describe myself are simple and mortal. Editor’s Note: I came away from this interview learning Maria never personally felt the injustices affected her so acutely as they did those around her, yet she felt strongly enough about them to act. “I had food; others didn’t.” “We had land; others didn’t.” That says much about her magnanimous character. We would have loved to spend another several hours chatting with this gracious, compassionate woman. However, twilight loomed in the distance and we have faced an arduous four- hour drive around hairpin curves on unpaved, unlit mountainous roads to negotiate. Regretfully with dozens more questions on my paper, we said goodbye to this remarkable woman. Maria in front of her house in Chalatenango Department.